Michael Okpara University of Agriculture, Umudike (MOUAU) Acceptance Fee Payments, Registration and Admission Clearance Guidelines for Fresh Undergraduate Students for 2018/2019 Academic Session. 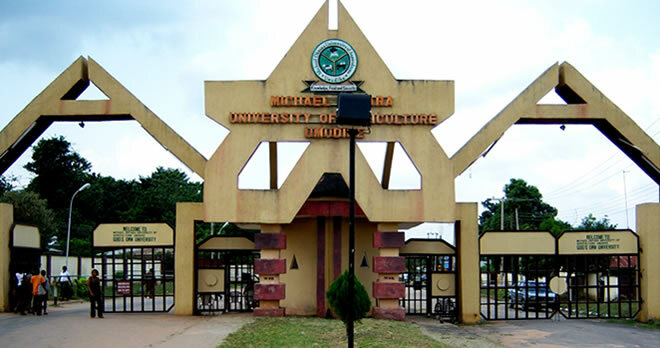 This is to inform all newly admitted students of the Michael Okpara University of Agriculture, Umudike (MOUAU) that the university management has released the registration and admission clearance guidelines for 2018/2019 academic session. 1. After printing acceptance and accepting admission. 3. Go for departmental clearance at your department and obtain the Departmental Clearance form. 4. Proceed to Admissions office in Room 126 for signing and stamping of the Departmental Clearance form. 5. Then pay for Accommodation. 6. Then pay school fees/ charges. 7. Proceed to fill the Biodata form after which the matriculation number is generated. 8. Proceed to online registration of courses. 10. Collection of Class Admit cards. 7. Remita link is now displayed. Student should click on the “Make Payment” button. The Remita payment secured platform shows up. Student details are displayed. Student can select either “Internet Banking”, “Master Card” or “Visa”. a. If student is paying with internet banking,student should select Internet Banking Option and his/her bank and click on Submit button. A payment invoice is generated, which contains the Remita Retrieval Reference (RRR). At the bottom right of the payment invoice, student clicks on the “proceed to Internet Bank” option, signs in with his/her existing bank details and proceed to make payment. A payment receipt is sent to registered email address. b. If student is paying at local bank branch, student should equally select Internet Banking Option and select ANYBank, click on Submitbutton. A payment invoice is generated, which contains the Remita Retrieval Reference (RRR). At the bottom right of the payment invoice, student clicks on the “Print Invoice” option, prints this invoice page and proceeds to any bank for payment, after which a payment receipt is issued to the student at the bank. c. If student is paying via ATM card, (Master or VISA cards ONLY) the student should click appropriate card type, and enter card details. A payment receipt is sent to registered email address. P.S: If you are paying online (Internet Banking or via ATM cards), ensure that you print out your payment receipt! 7. Original Jamb Admission letter (printed from Jamb platform) The end-point of the departmental clearance/screening is the issuance of the signed Departmental Clearance form by the departmental officer to the student. Proceed to the Admissions Office in Room 126 for signing and stamping of the Departmental Clearance form. Then proceed to the PORTAL OFFICE for online clearance with documents as approved by the Departments. The portal then enables student to move up to the Accommodation platform for payment of accommodation. 2. Once Biodata, is done, student proceeds to the Department to collect the original copy of school fees receipt. With this receipt, student proceeds to the ID card Unit to capture and hence collect the School ID card. NOTE: Student will be required to create a username and password whilst filling the Biodata Form. Please keep these details safe and secure as you will always use them to access your personalized section of the portal. NOTE: The Registration process runs for the whole of first semester. Any student who does not complete his/her registration by the commencement of first semester’s Exams will be defaulted and will need to pay a late registration fees at the Bursary Unit before the student can go on to the next stage.